We left Lugano this morning and arrived in Venice this afternoon. After a quick lunch at the Hotel Danieli, where we are staying, we were off on a tour of St. Mark's Basilica and Doge's Palace. St. Mark's was another spectacular cathedral. Lots of history and symbolism. What struck me the most were the beautiful mosaic designs on the floor. Doge's Palace was okay, the ceiling in the main staircases were unbelievable as was the structure of the roof/ceiling in the 'largest single room without pillars in all of Europe' (almost sounded like largest ball of twine). Very impressive engineering feet, especially given that it was built in the 14th century. We had a delicious dinner at Antico Martini's. On a sad note, my computer was damaged in transit. I will try to keep these posts coming as Internet access is available. Ciao! 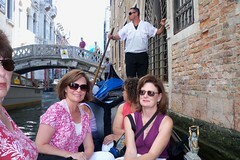 Would have been even more fun if you could have ridden the gondola with us. Then, we could have both had stupid faces.